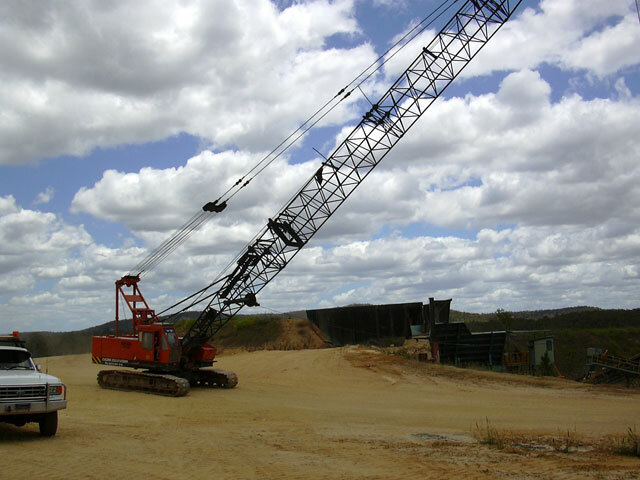 A classic dragline excavator features a pressure device that shifts large volumes of earth from the ground. Its approach to trenching and earth moving allows for quick results, reducing your overall costs. Two of our most popular dragline excavators include the Komatsu dragline excavator and the Hitachi KH150. Regardless of which dragline or crawler crane you choose, you can rest assured you’ll benefit from highly-trained staff who usually have at least 15 years of experience in the industry. With years of experience in surface mining, open-pit mining, and other challenging environments, we strive to make your project move both smoothly and quickly. While we prioritise speed, we’ll never do so at the expense of our outcomes. With machines from brands such as Cat and specifications spanning a multitude of sizes, no project is too big or too small. If you’re managing an open pit mining project or moving large volumes of earth, opting for a dragline excavator is essential. The Caldme range includes machines of various different sizes for different requirements. Overall, our machinery includes 4.5 to 85-tonne equipment, allowing you to tackle significantly sized projects. Whether you’re in Cairns, Brisbane, or Sydney, we’re happy to help you out.